Dr. Marc Faber, publisher of The Gloom, Boom & Doom Report, has three very bold predictions for the upcoming year. He's one of the world's most noted market contrarians. Now Dr. Marc Faber, publisher of The Gloom, Boom & Doom Report, has three very bold predictions for the upcoming year. Faber says: "My sense is that at the present time, the US market is relatively expensive compared to foreign markets, especially to European markets and to emerging markets. On a cyclically-adjusted P/E [price-to-earnings] basis, it is actually going to return very little over the next seven to 10 years. Faber says: "If you look at the entire market, some stocks are not terribly expensive and some stocks are very expensive. It's like in year 2000, not every stock was overpriced. At that time, the NASDAQ was grossly overvalued but, say, resource shares and so-called 'old economy' companies were relatively inexpensive or absolutely cheap. In the present instance, I think that stocks like Facebook, Tesla, Twitter, Netflix, [and] Veeva Systems are grossly overvalued and that the basket of shorts in these stocks will return you at least 30% next year." Faber says: "Given all the money printing that is going on globally – and not just in the US – and given that the total credit as a percent of the advanced economies is now 30% higher than in 2007 before the crisis hit, I think that gold is a good insurance." "I'd rather buy something that is reasonably priced. And, I think gold shares are very inexpensive. So a basket of gold shares I think next year could easily appreciate 30%." "I think the Vietnamese stock market, which this year was up 22% [and] which is not bad for an emerging market, will continue to go up." BONUS: Faber also the perfect holiday gift suggestion: "When it comes to charities, there's a lot of fraud. But there are also some real charities. I know a charity in Chiang Mai for orphans: Child's Dream. So, if you really want to give a gift to someone and you don't know what to buy, you give them some money." 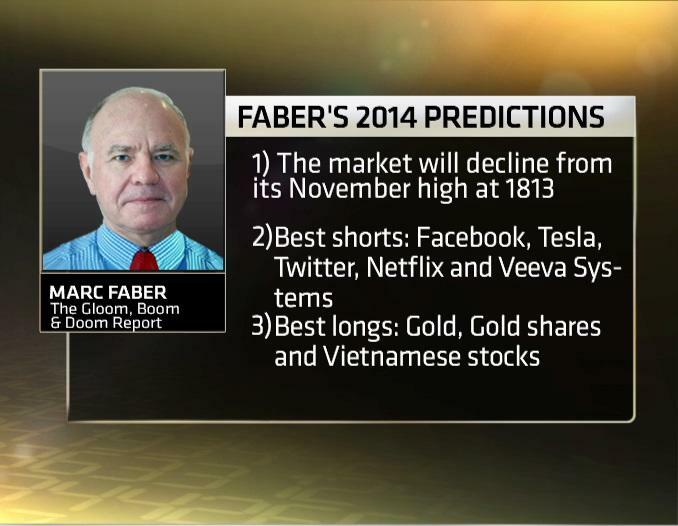 To see the rest of what Faber has to say about his 2014 predictions, watch the video above.